It's 2018 so it's time for our new year summary of what's been going on with Jomres over the last 12 months. Over the last year we've released 23 updates for Jomres, with hundreds of tweaks and improvements. For a complete view of all of the changes you should see the changelog however I'll give you a quick rundown of some of the changes later on in this post. Before I continue with the summary, I'd first like to introduce you to the new template package that Rodrigo Rocco from Jomres Plugins has been working on, called Valentina (demo). It is, without a doubt, absolutely stunning. It starts off with an AirBNB-esque map view and property list, which then takes you to a brilliantly worked property details page, and his sublime take on the booking form. Seriously, drop whatever you're doing and check it out. If you think it's time that your Jomres site had a bit of a facelift, then Valentina is exactly what you need. When I developed the template package functionality I was hoping that something like this would emerge and I'm delighted that Rod's taken the baton and is sprinting over the horizon with it. It is a bold template, a little different from the normal max-whitespace websites that are common nowadays, which is what I asked her for and I think it reflects Jomres' "punch above it's weight" attitude. Sonia's been fantastic to work with, she's gone the extra mile time and again for us and if you're in the market for a new Joomla website, you should contact her. I cannot thank Sonia enough for all of the effort she put into the site for us. As I said above, there are way too many changes to list here, however here's a summary of some of the more noticable changes to have come to Jomres in the last year. Refactored both front and backend menu systems. Plugin settings moved to Site Configuration and entire administrator area rebuilt to be more logical. Added Frontend Control Panel Widgets. The Frontend Control Panel is now dynamic, meaning you can add/remove widgets to the Property Manager's control panel as well as use Drag and Drop to move them around. The layout is specific to individual property managers, so each manager can choose to see what's important to them. Context sensitive video tutorials. Both administrator area and frontend. Videos are done without voice-overs or text so that they are largely language agnostic, the language file can be copied and edited by site admins if required for other languages. Property Completion highlighting. Properties that have been completed ( IE prices updated, images uploaded etc ) are now highlighted to site administrations that they're now ready for approval. This is useful if you use the property approval feature. Similar highlighting added to frontend property lists so that property managers can see those properties that are still awaiting completion. Session handling. Completely refactored to store data in the database, not files. Performance improvement. Room descriptions inputs and outputs. You can now add a tag line ( which is shown in room lists ) and a more complete description as well as upload unlimited numbers of images for each room. Support for property categories. This is a simple feature that allows managers to create property categories, which can then be added as both menu options to Joomla, or added as shortcodes to articles/pages in both Joomla and Wordpress. In the future we'd like to make this a searchable item. Guest blacklisting. Did a guest trash a room or smoke in a non-smoking room? You can blacklist guests so that they are no longer able to make bookings (this is done on a per-property basis). 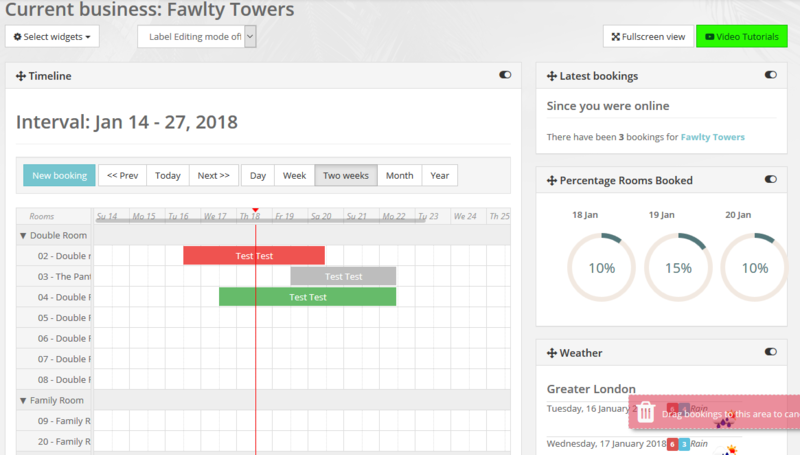 If the guest attempts to book they will instead be redirected to the Contact Owner form, so you haven't completely told them to Go Away, instead this gives you the opportunity to work out any issues you may have with them before they can book again. Email Admin when Jomres has a New Update. You asked, we provided. Added Amazon S3 and CloudFront integration for images. Image locations are stored to the database after uploading, which cuts down on the amount of directory traversals that are required when showing images. Another performance improvement. Jomres, when running on PHP 7 is blindingly quick. Global coupon codes. Created by site admins they apply to all properties. New setting to Tariffs and Currencies tab which allows property managers to save a basic price that would be shown if no prices can otherwise be determined. When properties are shown in a list, the system will attempt to find a valid price from configured tariffs based on either today's date, or if dates were used in a search, then based on those dates. If it cannot, then it will normally show POA (Price on application), meaning that the guest should contact you to get a price. If you want, you can configure a price here that will be shown instead of the POA text. This figure would be a "fallback" price to display if no other price can be determined. If you haven't yet used Jomres then you'll be pleased to know that you can opt for the new Developer Subscription free trial. This offers you a full 30 days of Jomres use, including access to the 4 Quickstarts and all Leohtian templates, absolutely free. Last year I ended the option for new licenses to be able to purchase renewals. This is because Jomres is morphing into becoming supported by subscriptions instead of one-off sales. Users who in the past had purchased Starter, Business or Enterprise licenses can still purchase renewal licenses until July 2018, however purchasers of the new Single Property or Developer one-off licenses will not be able to purchase renewal licenses. After running the numbers over the summer, and considerable work in the autumn, I have settled on 29€ per month as the optimum price for the Developer Subscription. We have a lot of users who have been using Jomres for years on end, and for them the one-off model is not appropriate. If there's a security release in Joomla or Jomres you need to be able to update immediately and not when funds allow. Too often we've seen users stuck on older versions of Joomla. Add this to the lumpy income stream that one-off sales bring and the logical conclusion is to drive Jomres towards a subscription supported product. Until the subscriptions are able to support Jomres completely the one-off licenses (Single Property and Developer) will still be available however I anticipate that they will be removed sometime this year. To encourage take-up of Developer Subscription, which is not encoded at all, I have priced it so that it works out as a saving of 25€ over a six month period. This is a really great price for a powerful product with unlimited support and unlimited websites. Remember, 29€ per month is typically less than the profit of one booking. You'd be mad use anything else.